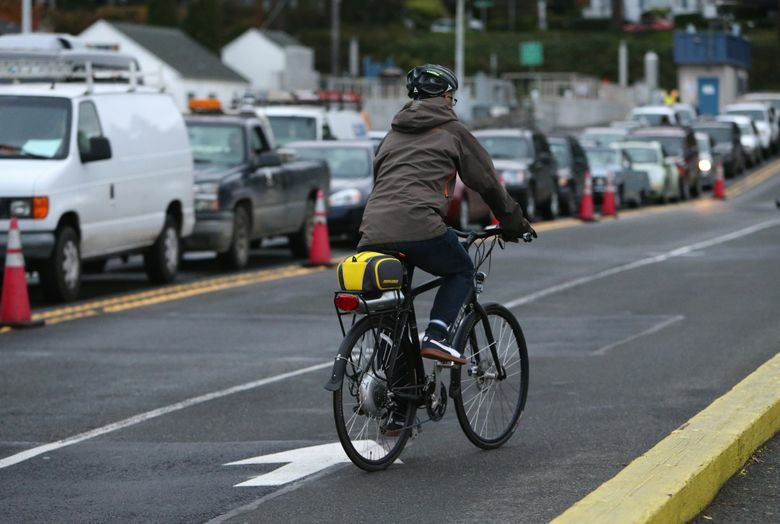 Here’s another option besides bailing out Pronto, Seattle’s failing bike-rental venture. Last week at the Target store near Pike Place Market, I watched a guy buy a green 10-speed bicycle that was on sale for less than $70. He added a lock — spending $99 altogether — then snipped off the labels with borrowed scissors and wheeled it out into downtown Seattle. That bike cost less than annual membership to Pronto, the failing bike-rental program Seattle’s City Council may vote to acquire next week. By taking the Pronto plunge, Seattle would commit to spending at least $6.3 million buying and expanding the network of clunky, green seven-speeds. It also obligates Seattle to cover yearly operating costs approaching $2 million. Costs include $600,000 for “equity” — a plan to subsidize Pronto usage by the poor and add more South End stations. I didn’t ask the Target cyclist his income — perhaps he could afford a nicer bike, maybe he was just a smart shopper — but he might be an equity candidate. Yet, instead of taking a handout providing discounted, 30-minute rides on city bikes that must be parked at Pronto stations, he obtained true mobility and freedom to ride and park whenever and wherever he chooses. I’ve written before about Pronto being a luxury for a city that can’t afford basics, such as maintaining roads and parks, without special levies. Pronto is also a distraction amid Seattle’s homeless and heroin crises. Still, the debate over Pronto continues, offering perspective on how Seattle operates. Dogged support of Pronto by Mayor Ed Murray’s administration and some council members suggests they’re unwilling to acknowledge when reality conflicts with their ideology. City Hall claims to be data savvy. So when data show something isn’t working as promised, it should be able to change course, own the mistake and learn from it. Seattle’s signature companies do this all the time, and that’s why they succeed. They would fail if they never let go of costly, failed projects. Is Seattle doomed to permanently support pet programs that don’t work? Pronto suggests that’s the case. This adds to a sense of hopelessness some feel about the direction Seattle is heading and about sweeping changes being made to streets, neighborhoods and communities, with questionable outcomes. Residents might be more amenable to change and experimentation if officials were pragmatic, flexible and willing to make corrections as needed. Instead, they get follies like Pronto from leaders who seem beholden to special-interest groups. It doesn’t help appearances that Seattle’s transportation chief, Scott Kubly, previously was an executive at the company operating Pronto. Kubly and other Pronto advocates argue it should be subsidized as an extension of transit, but they don’t provide much data showing Pronto’s used that way. Where Pronto now operates, there are transit stops every few blocks. It’s quicker to walk to a stop than rent a bike, pedal to another kiosk and return it. Plus, walking is free while Pronto charges $8 to $85 for passes allowing rides up to 30 minutes. Seattle can’t afford to put Pronto everywhere or run enough vans to move that many bikes back and forth as needed. But even if Pronto saturated Seattle, you can’t fully rely on it — bikes might be taken when you need one. So if people need a bike to get around, the best option is to own one. Then they can ride anytime and park most anywhere — like the cyclist at Target. He made me think about what Seattle could do with money it’s aching to spend on Pronto. Seattle schools have around 4,200 fifth-graders and 3,200 seniors. If the city shopped carefully, it could buy them all inexpensive bikes, locks and helmets for around $1 million a year. This would cost $400,000 if limited to kids getting free and reduced lunches. The city probably spends $400,000 yearly on meetings and brochures to increase cycling. Imagine how much mobility and equity would be created by giving these students bikes when they graduate from elementary and high school. Compare that to the cost of buying a little-used rental venture benefiting a sliver of the population. If Seattle insists on a public-private bike-sharing partnership, find a partner like Village Bicycle Project, a nonprofit that fixes bikes and sends them to Africa. It could help source inexpensive bikes and find homes for outgrown ones. Instead of pressing companies to sponsor Pronto, Seattle could ask them to help buy every student a bike. Really, the $6.3 million earmarked for Pronto could start an endowment that buys bikes for needy students every year, forever. That’s real bike sharing. Or Seattle could dig in its heels and spend millions propping up a foundering bike-rental venture in a city known for its rain and hills.